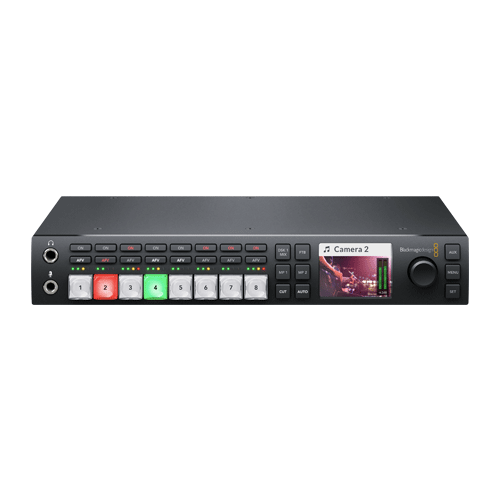 Blackmagic Design announced ATEM Television Studio HD, a broadcast quality live production switcher designed for both broadcast and professional AV users. ATEM Television Studio HD features 8 inputs, multi view, aux, and program outputs, analog audio inputs, built in talkback, two flash based media players, incredible creative transitions, a DVE for effects and more. The new ATEM Television Studio HD replaces the original and extremely popular ATEM Television Studio. It features four 3G-SDI and four HDMI inputs so customers can connect a total of up to 8 different sources such as professional SDI broadcast cameras, consumer HDMI cameras, computers and even video game consoles. ATEM Television Studio HD is compatible with all SD and HD formats up to 1080p60. There are two channels of analog audio in, RS-422, Ethernet and a built in IEC power supply, along with program and auxiliary outputs. Customers also get both SDI and HDMI multi view outputs so they can monitor all sources, preview and program outputs, along with labels, audio meters and more, all on a single big screen television or broadcast monitor. ATEM Television Studio HD is perfect for everything from professional broadcast studio shows and broadcast sports, to customers working on video blogs, gaming videos, internet talk shows, weddings, concerts, seminars and more. It also features resynchronization on every input so switching is completely glitch free. That means customers can even use it as a front end controller for AV systems and cleanly switch between sources with the press of a button. Featuring an extremely portable design, ATEM Television Studio HD is the world’s smallest all in one broadcast switcher. It’s only ⅔ of a rack space wide and is packed with high end broadcast features that make it possible to create an entire live switched program, complete with effects and transitions, right from the front panel. The front panel features 8 large buttons for switching between sources, along with corresponding audio buttons, down stream keyer, fade to black, media player and cut buttons. There’s also a built in LCD screen, spin knob and additional buttons for menus and to adjust settings like transition and effect parameters. Customers simply press the button for the source that they want to see next in the program, then hit the cut or auto button to switch sources, add effects, or even key in graphics.